A Pius Geek: TONIGHT ON THE CATHOLIC GEEK: Karina Fabian and Infinite Space Infinite God! TONIGHT ON THE CATHOLIC GEEK: Karina Fabian and Infinite Space Infinite God! Remember when I took a look at Karina Fabian's Infinite Space Infinite God II? 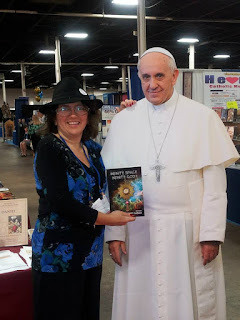 It was an anthology of Catholic Science fiction. It was odd, but fun. Like every anthology I've ever read, it had some hits and misses, but it was overall fun. Now, tonight, on the Catholic Geek, I have Karina and one of her authors from the original ISIG (and ISIG II) Colleen Drippe. Tonight, at 7PM, EST, I will have both Colleen and Karina On my radio show. Keep in mind this link right here will not play anything until that time. What I will cover, to my chagrin, will be Pope Francis, his global warming encyclical, and his statements on guns. Oy. Remember, this IS a call-in show. You CAN call in. The number is in the link. Good show today! It was interesting to hear about how Catholicism influences spec-fic. I'm enjoying the shows, John. What's on the agenda for next week? The agenda for next week is Steph Souders of RightFans, discussing Catholic images and themes in B5, the fiction of C.S. Lewis, and a retrospective on A Canticle for Leibowitz.